His endless motivation to further the education of the students participating in the after-school program at Paradise Creek is truly inspiring. Through his volunteering, his interaction with students has caused them to change their perspective of education and has shown to them why education is the key to success. Miguel is a bright, young man who truly inspires those around him. 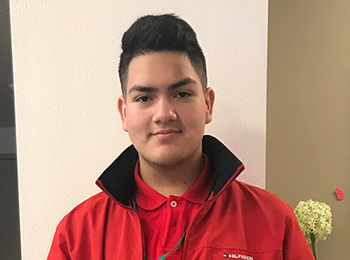 Miguel has risen from being a teen afterschool volunteer to becoming Paradise Creek Community’s Volunteer Leader (CVL) in the Community Learning Center. Part of his role as an afterschool volunteer is working with K-5th-grade students, enhancing their literacy skills through academic support, read-aloud activities, and homework help. Despite the many responsibilities that Miguel has at home and at school, he has found the time to volunteer every single day as well take on new challenges. Because of his strong leadership and passion, Miguel decided to continue supporting his community and become the first teen to transition to the role of Community Volunteer Leader. As a CVL, Miguel opens the Community Center and leads our afterschool-learning program, making it a fun, safe, and supportive place to learn. Miguel is now trained and able to run the after-school program on his own. Miguel’s ability to take initiative has allowed for new relationships to be built with the residents as well as with our outside partners. Miguel has one young sister who he brings with him to the Learning Center every day. He is determined to making sure that his sister receives one-on-one support and continues her education. The passion that Miguel has for helping our community goes beyond any expectation. Half of our students who attend our Learning Center are young boys; Miguel has been a positive male role model for all of them. Our students see that Miguel is dedicated and committed at a very young age and they strive to be just like him. Miguel has offered advice and helped them relate to the students in a way they feel inspired and appreciated. Not only is Miguel a role model for students, but he has also expressed an interest in helping other after-school programs like the Boys and Girls Club. As a graduating senior, Miguel will be attending college in the fall to become a Social Services major. Miguel is a resident of high moral value who influences those around him through compassion, intelligence, and dedication. The Paradise Creek Community Learning Center is truly grateful to have such an inspiring, motivated young man who has greatly influenced the community around him. In May 2018, Miguel was honored with a Ruby Award for Outstanding Resident Leader from the San Diego Housing Federation. He accepted his award from National City Councilmember Alejandra Sotelo-Solis.